For those who are looking for a fast printer that will accommodate heavy duty print jobs of your office, Ricoh SP 4510DN can be the best solution. Launched by Ricoh, this machine offer the speed of 42 pages per minute. This is surely a great news for offices with high productivity. Its maximum duty cycle is very exceptional, with up to 150,000 prints, ensuring its durability to high print jobs. The warm-up time is also faster than most laser printers, with only 17 seconds. The maximum resolution of Ricoh SP 4510DN is above average, with 1200 x 1200 dpi. Its maximum paper capacity is also very nice, with 1600 sheets, making this device suitable for large and medium offices. The power consumption is slightly lower than its competitors, with 561.7 watts during operation and less than 1 watts during energy saver mode. It also comes with automatic duplexing, enabling the device to run two-sided printing easily. 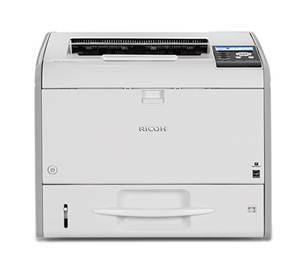 Ricoh SP 4510DN comes with compact size for a laser printer on its class, with only 15.5 kg in weight and 306 x 392 x 370 mm in height, depth, and width respectively. Additional space is not needed and you can move it around easily. Download the latest drivers for your: Ricoh Aficio SP 4510DN Printer to keep your Ricoh product up-to-date.